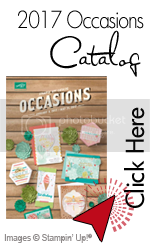 Yes, you read that correctly, this will be my last newsletter as a Stampin'Up demonstrator. 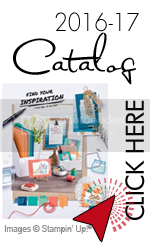 It's been a work in progress...more of an internal work...I've been a Stampin'Up demonstrator since 2004...it's been a long time and I feel like it's time for me to move on and make a change. I have loved being a part of Stampin'Up and I will be forever grateful for being part of such a good company. I still love stamping, scrapbooking and paper crafting and will continue to create in my studio but my main focus needs a readjustment at this point in time. Who knows, the cards may realign themselves in the future and I may join Stampin'Up again but for now this is not my ultimate desire. With that said, I wanted to thank you all for your support in my journey as a Stampin'Up demonstrator and for looking to me for ideas, inspiration and help with your paper crafts. I am still an active demonstrator so you will still be able to place on online order and indicate me as your demonstrator but that will most likely change after this quarter so until March 31st. This is a brand new mini catalog and all the contents of this catalog will be available until May 4th, 2017. 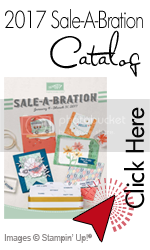 To view the pdf file of this catalog click on the upper right hand side of this page where you see the icon "2017 Sale-A-Bration"
This promotions is only available until March 31st. I hope I was able to inspire you one last time here with this last newsletter of mine. Wishing you all a very wonderful 2017!! !